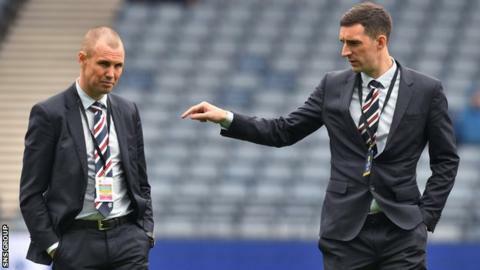 Kenny Miller and Lee Wallace have been suspended by Rangers pending an investigation into an angry exchange with manager Graeme Murty. The experienced duo are understood to have rounded on Murty following Sunday’s 4-0 Scottish Cup semi-final defeat by Celtic at Hampden. The news was confirmed in a brief club statement issued after a Tuesday morning meeting with the players. The statement says Rangers are looking into a “team-related incident”. The Ibrox club also say they will “make no further comment until this investigation has been completed”. Former Scotland striker Miller, 38, was an unused substitute at the weekend. Left-back and club captain Wallace, 30, has been sidelined since mid-September because of injury. Miller’s contract runs out at the end of the season, while Scotland international Wallace has a year left on his deal.